Easy installation via FOMOD. Offers options for the three Plugin Loaders, Skill Cap and Leveling Progression. Also offers an additional "fix" for the Apocalypse mod. More informations and a troubleshooting guide can be found in the description. This bug seems to be fixed! But I still recommend double checking it on your system. Choose a SkyrimUncapper.ini that allows going over 100. Test, if the .ini is correctly loaded every time you start the game. Load a save, open the console and type in "player.advskill alchemy 1000000000000". If Alchemy is capped at 100, it doesn't work. Once it works, it works until you start the game (skse64_loader.exe) again. You are not safe, just because it load once. I recommend testing it multiple times over the course of a playthrough until you feel like you are safe. You can choose, which Plugin Loader you use during installation. The .ini will be installed into the right folder automatically! You have the choice between 100 (Vanilla) and 199 ("uncapped"). The Formula Cap will stay at 150. Vanilla or Adjusted (made while using Ordinator). 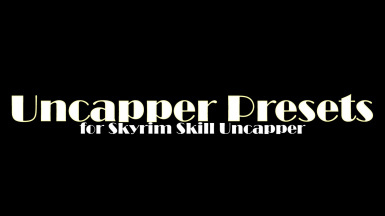 Additional support for those that use Apocalypse - Magic of Skyrim and especially the autotrigger magic in that mod. If you have ever used it, you will know, that autotriggering skills increases the skill level of the triggered spells way too quickly. This option reduces leveling speed of Illusion and Alteration to roughly 1/3 of how it would level normally. If you think that it is too low, you can still manually adjust it of course. If you use different spells that are not in the Illusion and Alteration area or encounter similar problems, you should manually adjust the values in the SkyrimUncapper.ini. Note: Generally, leveling will be a lot slower with this option. Adjust it, if it is too slow for you. - The more you progress, the less your stats increase per level. After Character Level 50, you will get significantly less stats, making the late game more challenging. - Tweaked Carry Weight. Health and Magicka give you some carry weight as well now.